Aerospace was the workhorse behind better-than-expected earnings at General Electric Co. and Honeywell International Inc. The question for GE is whether those good results can last. Both companies reported first-quarter earnings per share that surpassed analysts’ estimates, and their stocks climbed. It’s hardly a straightforward comparison, as estimates for GE’s profit had been heavily reduced going into the report whereas Honeywell topped elevated expectations. GE was celebrated for not cutting its guidance (yet), while Honeywell raised its EPS outlook. The common thread, however, was a rock-star performance by the companies’ respective aviation units. GE shares were up about 5 percent in early afternoon trading. It’s only the second post-earnings gain for the company since the start of 2016. At Honeywell, aerospace revenue grew 8 percent on an organic basis (excluding the impact of currency swings and M&A). It credited continuing strong demand for commercial jet components as global air traffic rises, and as Boeing Co. and Airbus SE capitalize on healthy backlogs. Honeywell also pointed to signs of recovery in demand for business jets as the market works through an oversupply of used planes. 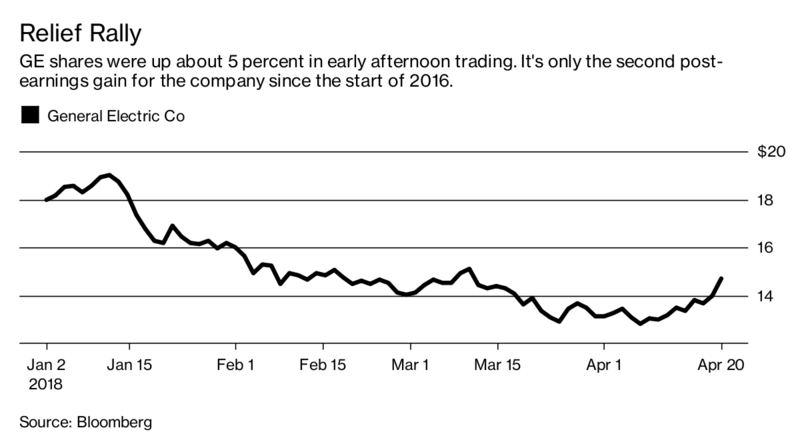 Weakness in that market had weighed on Honeywell’s aerospace results in past years, to the point that activist investor Dan Loeb of Third Point LLC called unsuccessfully for a spinoff of the whole aerospace unit. This is a classic Honeywell move. The company sets targets it knows are achievable so that it can surprise to the upside, and investors love it for that. GE is in the opposite position. The 26 percent profit growth and 6 percent organic sales boost in GE’s aviation business in the first quarter were stellar and exceeded analysts’ expectations, so credit is due. But it will likely have to repeat that kind of perfect performance throughout the year in order to meet its 2018 adjusted EPS outlook of $1 to $1.07. And that’s going to be difficult. GE said Friday that profit for its troubled power business will likely be flat this year relative to the roughly $2 billion it earned in 2017. That is below what was implied by management guidance at the company’s November investor day. GE is also contending with expectations for no earnings contribution from GE Capital. But even so, it thinks stronger numbers from aviation and health care, in combination with aggressive cost-cutting, will make up for the shortfalls elsewhere. In November, GE called for operating profit growth of 7 percent to 10 percent in its aviation business in 2018, which implied profit of about $6.3 billion, based on its estimate at the time of the impact from an accounting rule change and its reported 2017 results. But the accounting-related restatements ended up having a bigger negative impact on the segment’s profit than GE had projected, and that means it has a higher hurdle to clear. To get $6.3 billion in 2018 aviation profit, GE now needs to grow earnings at the unit by more like 18 percent year over year. GE didn’t give a specific updated profit guidance for aerospace, but CFO Jamie Miller said the outlook was “solid” and CEO John Flannery said he expects “better” earnings. The challenge is that GE benefited in the first quarter from shipping about 70 fewer of its Leap jet engines than originally planned. Because the jet engine is fairly new, it tends to be less profitable than legacy GE products as the company works to lower production costs. GE expects to ramp up deliveries throughout the rest of the year and still meet its 2018 goal for 1,100 to 1,200 shipments, which suggests some profit headwinds. Miller says she expects to still benefit from more profitable spare-parts sales throughout the year and that will help mitigate the impact from the Leap. It still feels like GE’s outlook is optimistic and requires a lot of things to go right, whereas Honeywell is prepared for things to be less rosy. And that should give investors pause.